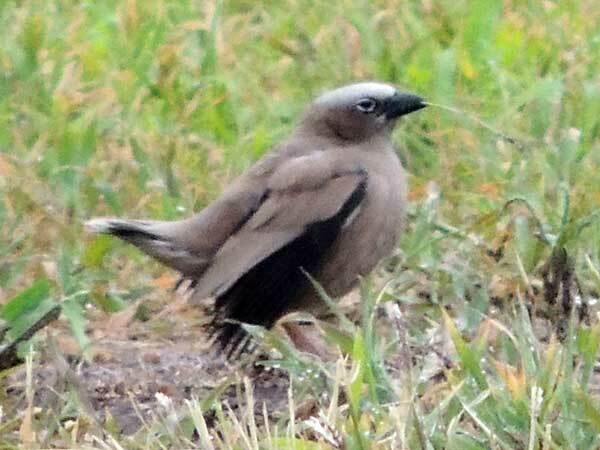 The grey-capped social weaver or grey-headed social weaver is a sparrow-like bird, with a pale grey crown, a dark grey bill, a whitish eye-ring, horn-colored legs, with some black in the wing and a light terminal band in the tail, that builds roofed nests made of straws, breeds in colonies in thorny Acacia trees, and feeds in groups gathering grass seeds and insects. Male and female have near identical plumage. Recent DNA-analysis confirms it is part of the weaver family. It is found in Ethiopia, Kenya, Somalia, South Sudan, Sudan, Tanzania, and Uganda. Copyright Michael J. Plagens, page created 20 Sept. 2017.